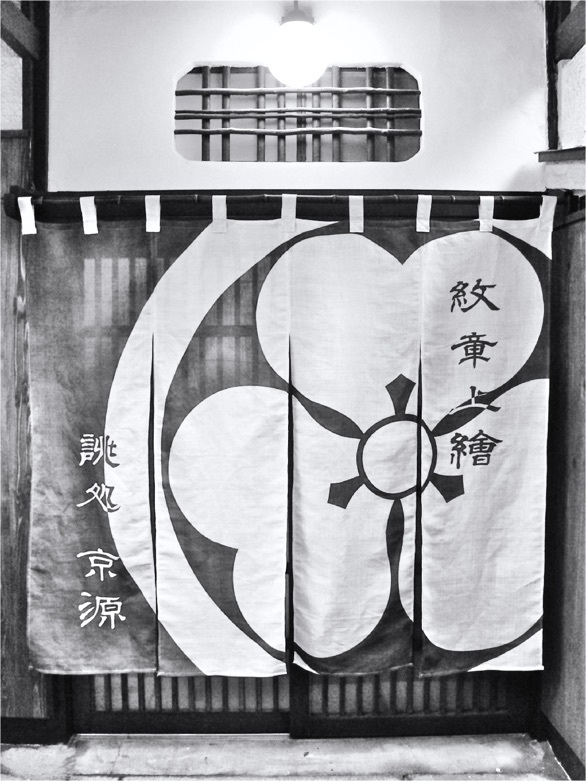 There’s a thousand year tradition that Japanese pass their family crests from generation to generation. 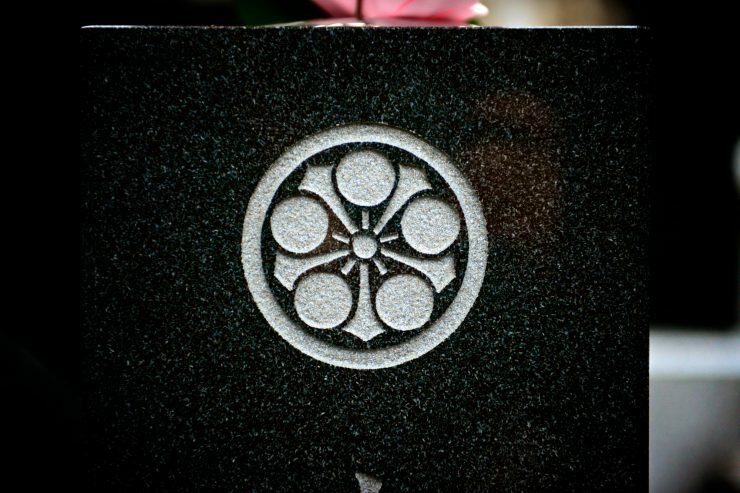 The family crest is called “Kamon” in Japanese, which could be seen everywhere in Japan. Kamons are symbols for each family in Japan from general family to royal family. 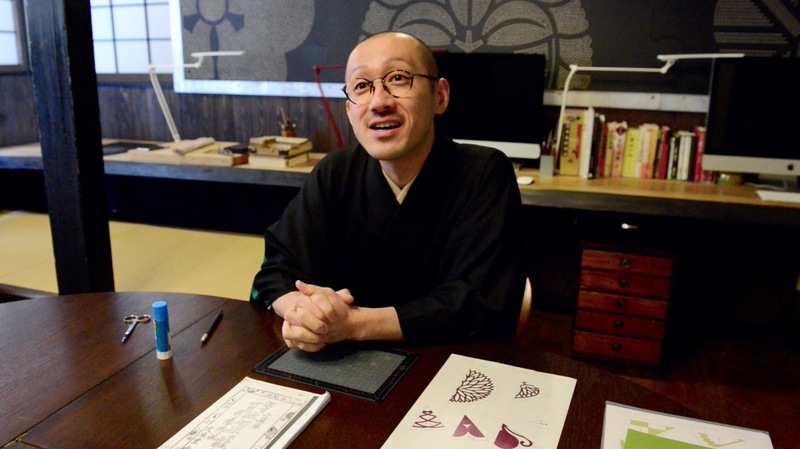 “Monsho Uwaeshi” – They are Japanese family crest artisans who are highly experienced in designing a new yet traditional pattern. They are the torchbearers of this beautiful culture to the later generations to come. 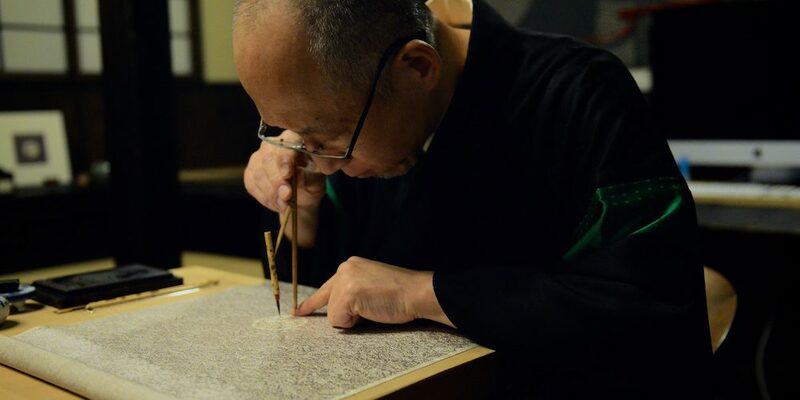 We were truly fortunate to have an opportunity to interview with two Japanese family crest artisans at their studio and they welcomed us warmly. 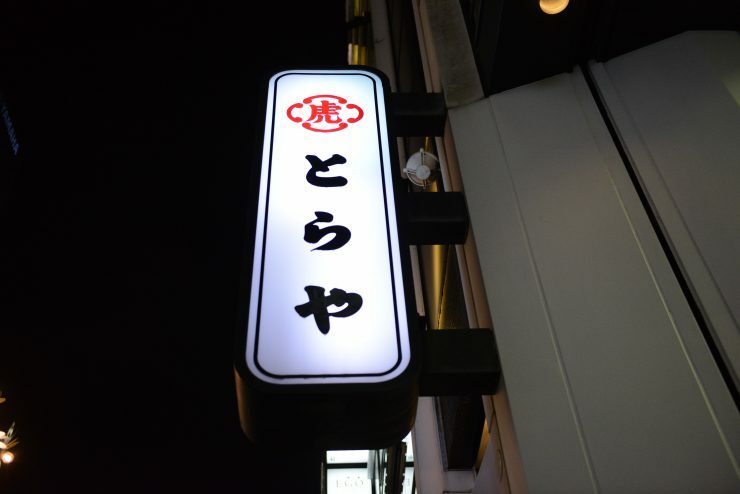 Their design studio is located in the heart of old Tokyo. 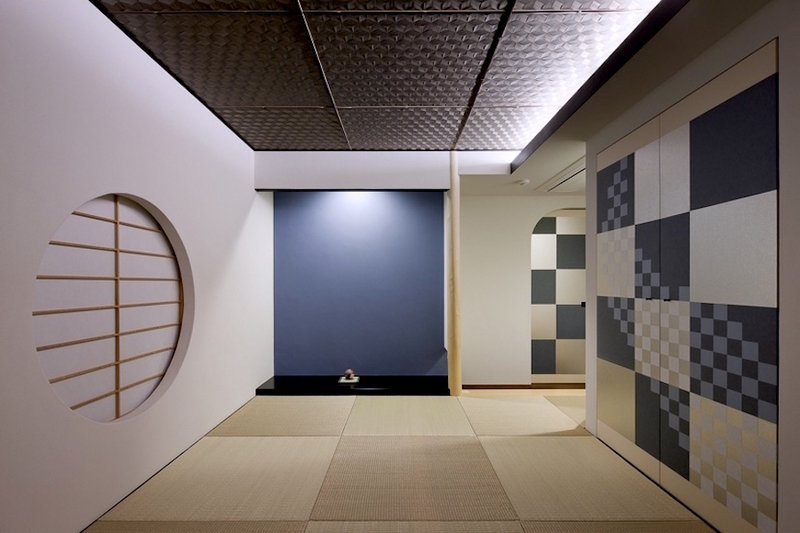 A well-decorated old Japanese-style house interior which they created themselves from buying materials on the internet, makes you feel excited at its design and your back straight at the same time. 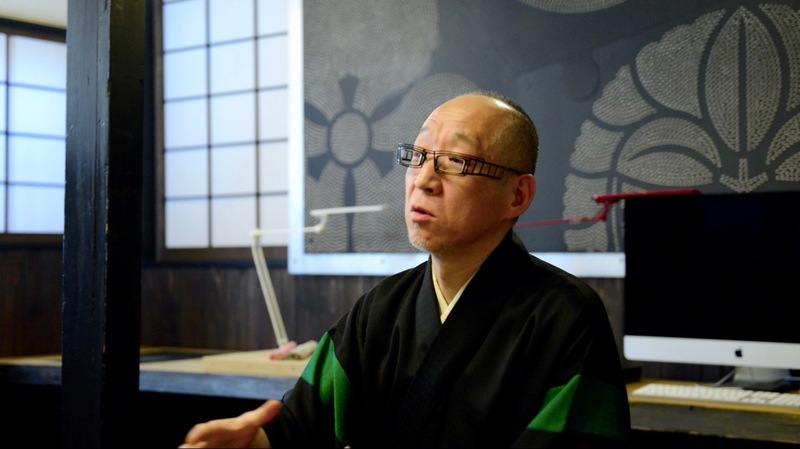 Shoryu Hatoba and Yoji Hatoba, the Japanese family crest artisans work at their studio in Ueno, Tokyo. 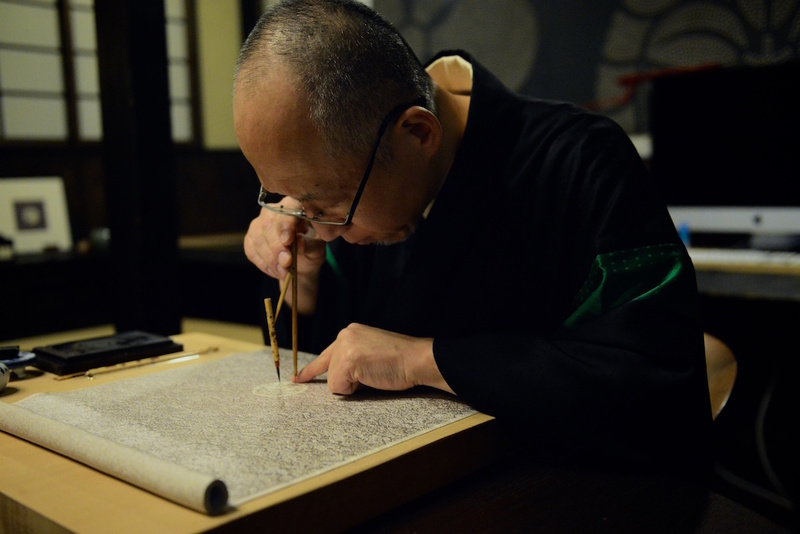 Shoryu is the 3rd generation of Monsho Uwaeshi, began his career as a traditional Japanese family crest artisan. His father was the one who developed the framed family crest. 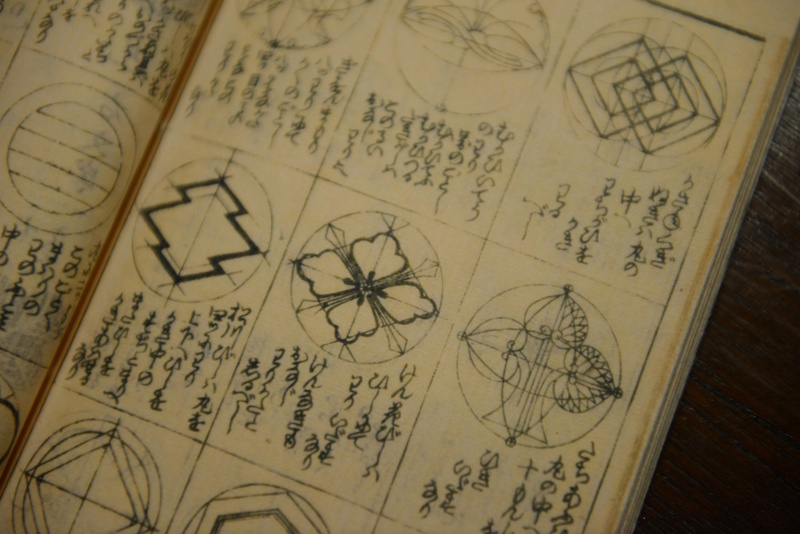 When he turned to 50, his desire to create something new made him produce “kamon x komon” features the Edo-komon which is a particular dying technique of repeated small pattern. 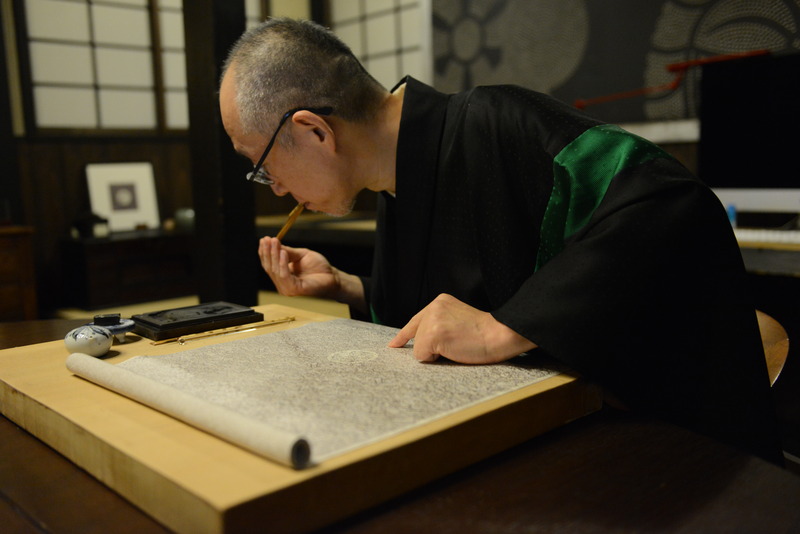 Shoryu’s first private exhibition was held at a historical archive in Vienna, Austria. They used to work only on kimono but their field is expanding. 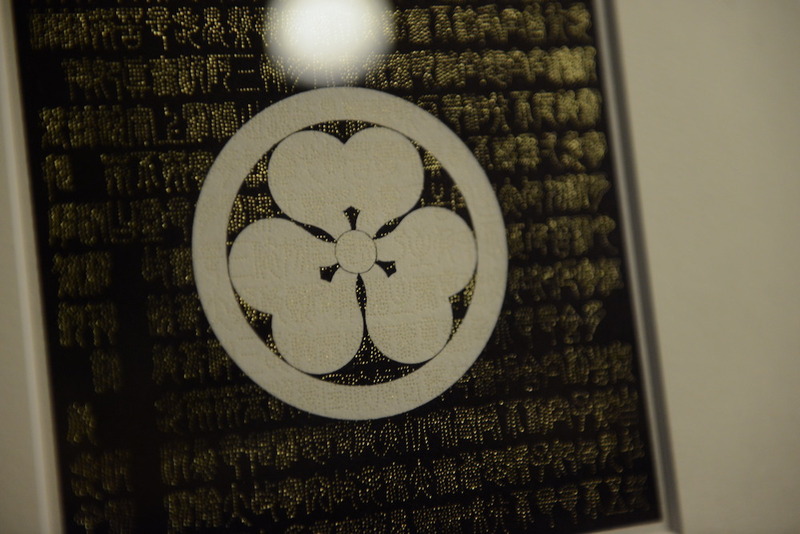 Traditionally, they worked only on kimono to draw the family crest on it. 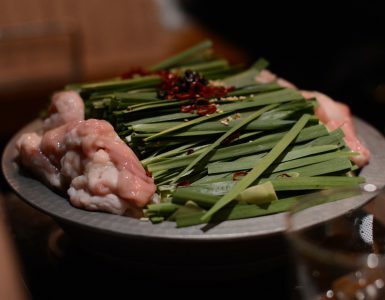 We could say there were two prime times for the kamon tradition and traditional Uwaeshi. 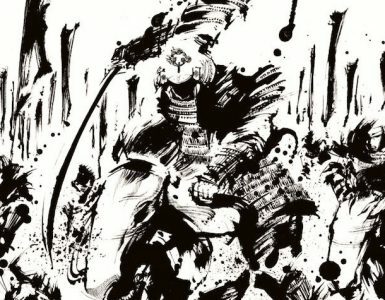 One is back in the Sengoku period where Samurai fought for their lives and the family crest they bore on the battlefield were precious next to their lives. Another one is back in the Edo era, even after Samurai left the battlefield they still need the family crests for the rituals and events to clarify their lineage. In addition to that, general people began using family crests in this period which boosted a number of crests exponentially. 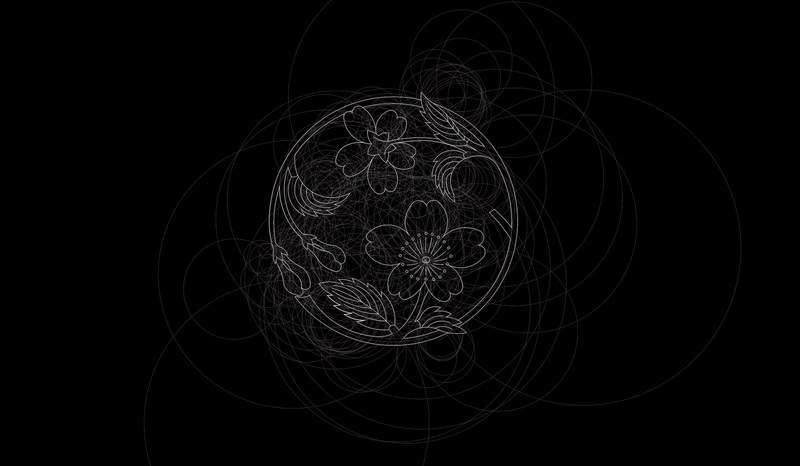 The patterns which were loved by court nobles adopted by Samurai to recognize each other on the battlefield. 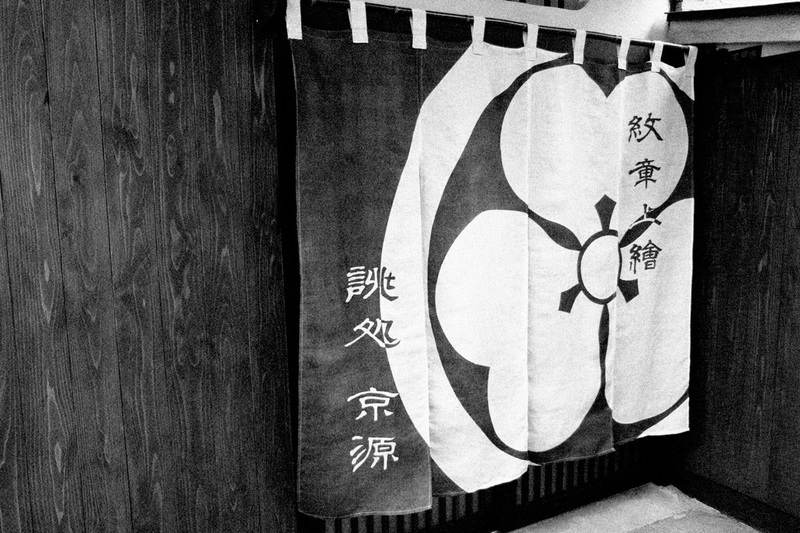 Its design is unique, sophisticated, and each Kamon has its own meaning based on bearer’s wish. Thousands of Kamon have been inherited from generation to generation to show the lineage of the family. 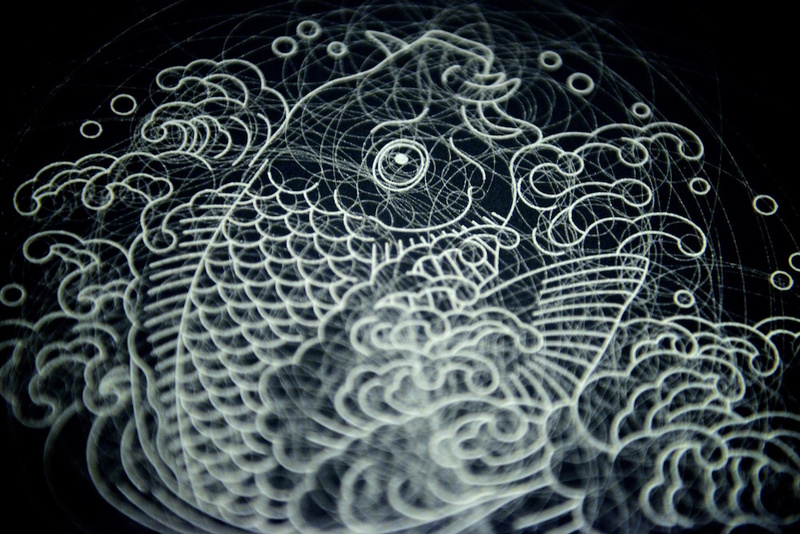 Those beautiful patterns have been created by professional designers called “Monsho Uwaeshi”. 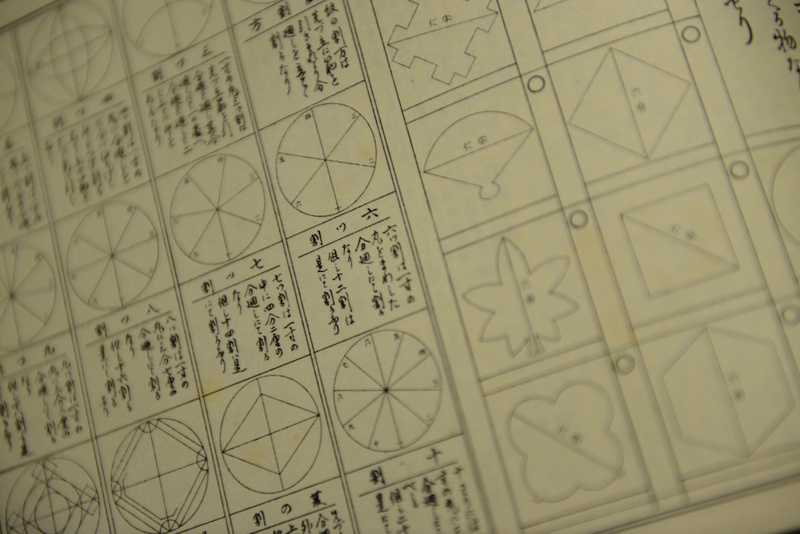 Their main work was to draw the pattern of the crests on Japanese kimono. In the course of time, the Kamon tradition spread among general people and quite a few numbers of humorous crests were created. 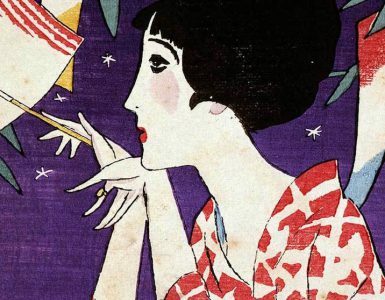 However, do we see Japanese people put on kimono as a daily outfit? Not anymore. This answer doesn’t mean the end of this tradition but does exactly the opposite. You think of a willow, even the strong wind can’t tear them down. The tradition we see today from the old times has flexible quality without an exception. 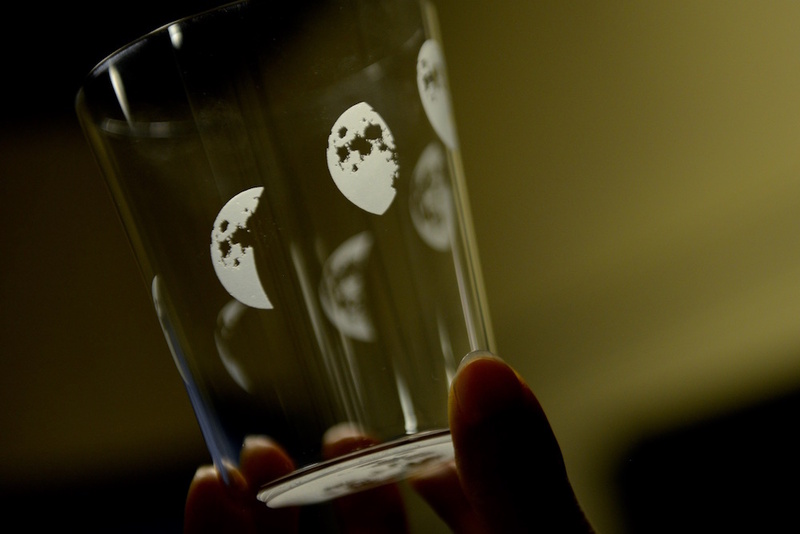 Contrary to the image of being ‘artisan’, their view of work is wide and flexible. 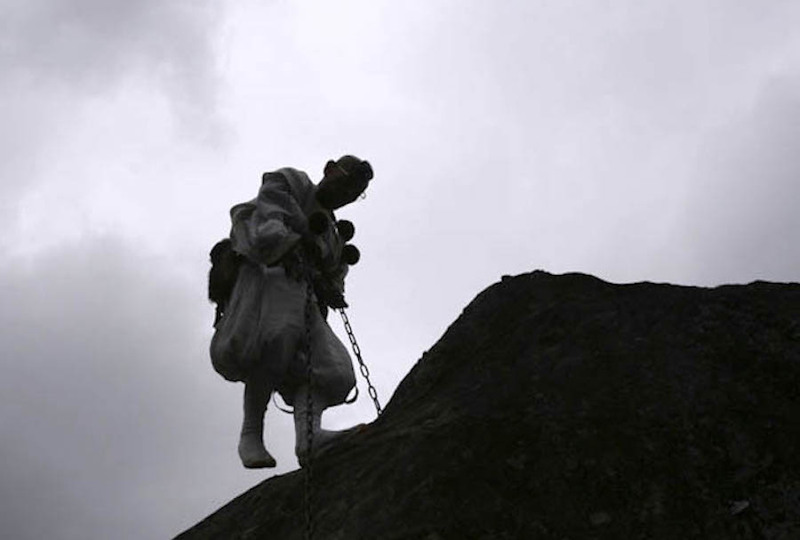 When it comes to the style of Monsho Uwaeshi, the attitude of working with collaborators is one of the most important keys to keep their tradition alive. They create new designs while they follow the tradition backed by its origins and history. Better than anything, they intrinsically know the beautiful and cool design which can be created only by the experienced ones. 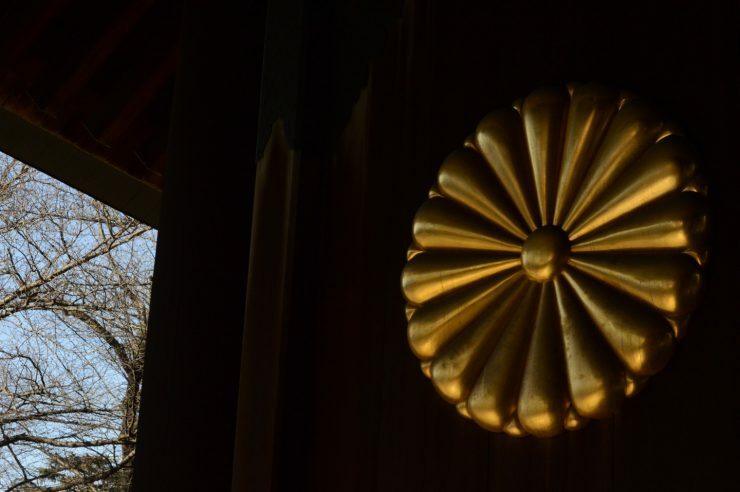 Originally, the Kamon tradition can be traced back to the patterns court nobles used in the Heian period (794-1185). 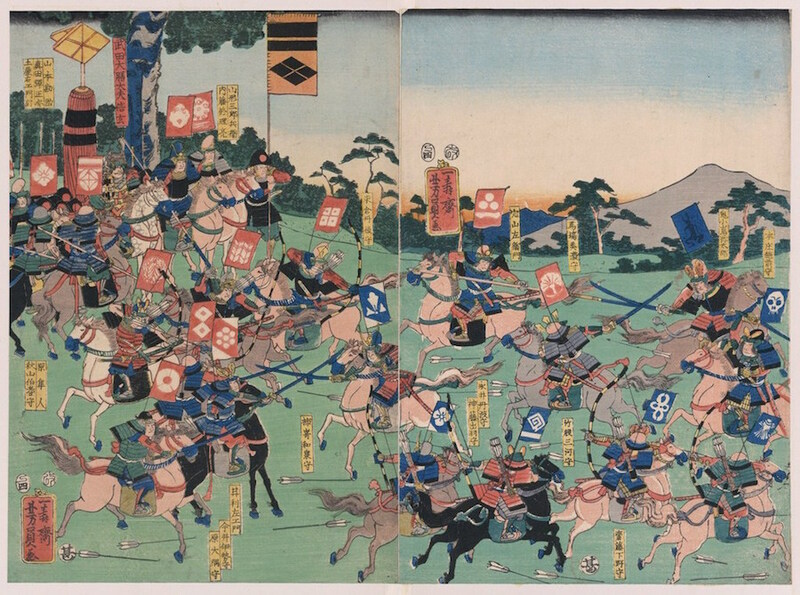 After they were used vigorously on the battlefield by Samurai in need of recognizing from friend and foe, the tradition widespread among general people in the Edo period (1603-1868). Unlike Samurai liked the simple, clean, and highly visible patterns, general people enjoyed the stylish patterns with a sense of humor. Those demands boosted numbers of unique Kamon in this period and a lot of them were lost in time. They throw workshops from time to time to open up the doors for people who have not seen or experienced Japanese family crest. It’s called “Monkiri”, you fold and cut the origami paper in a certain way, open up, and you’ll find the amazing pattern of paper in your hands. The 4th generation of Uwaeshi, Hatoba Yoji mainly takes care of the workshop of Monkiri. The pattern people originally used was family crest and the more you practice on them, you could create more elaborate and beautiful pattern. They found out this game in the search to find a way to spread this tradition. It’s quite a coincidence that turned out it dealt with Japanese family crest patterns originally. It’s used to be taught in schools and every girl knew how to cut them out and learned the beautiful patterns naturally. 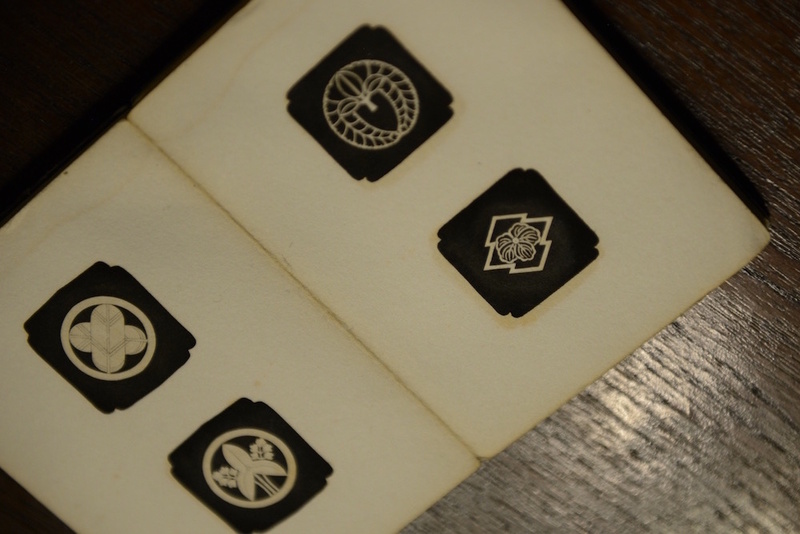 Once they were asked to teach foreign exchange students about the history of Japanese family crest at Waseda University and they found them interesting. They introduce Monkiri to people around the world hoping it would let them have interests in the kamon and that would make a great start. In addition to that, this pattern-cutting game is a great way to have the time to concentrate and release just like one of the effective meditation methods for your mind. Oh, by the way, have you checked their website? If not, we suggest you do so now. You wonder who created this cool website for them? Yoji did himself and after that, a lot of clients were coming in and still, they are. From the design of their website, you can imagine what you can expect, can’t you? 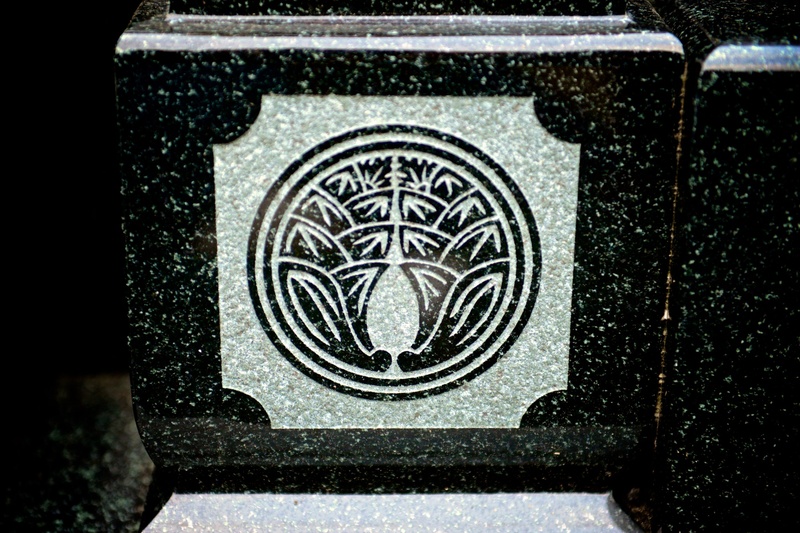 Japanese family crest has its own spot on the various crest designs. Compare to the western coat of arms, it stands out for its simplicity and high visibility. This different design comes from the different thoughts of patterns. Shoryu explains the differences between them with the example of fountain patterns. You see western fountains designed to spout in the air while traditional Japanese style fountain designed to flow water downward as a natural river flows that way. 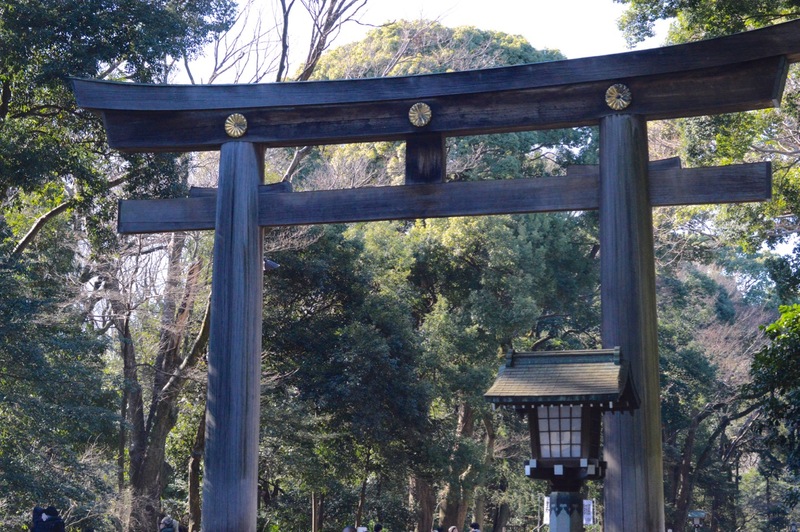 The natural features and climate form the particular sets of thoughts and culture, the ideas of Shinto are exactly based on them. The beautiful design itself has its value and the fact they have a long history underneath make it even more valuable. What Makes Their Design Outstanding? 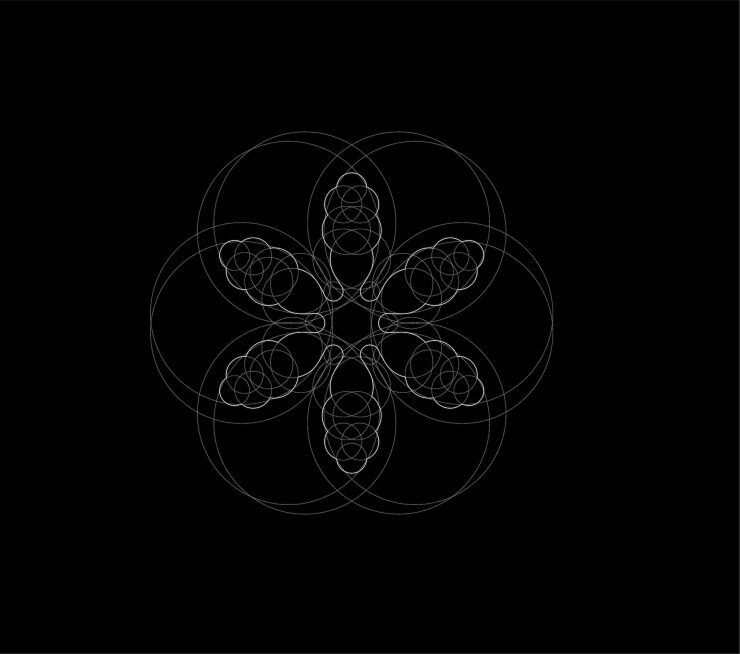 The Japanese family crest patterns can be described in a word – an arc. 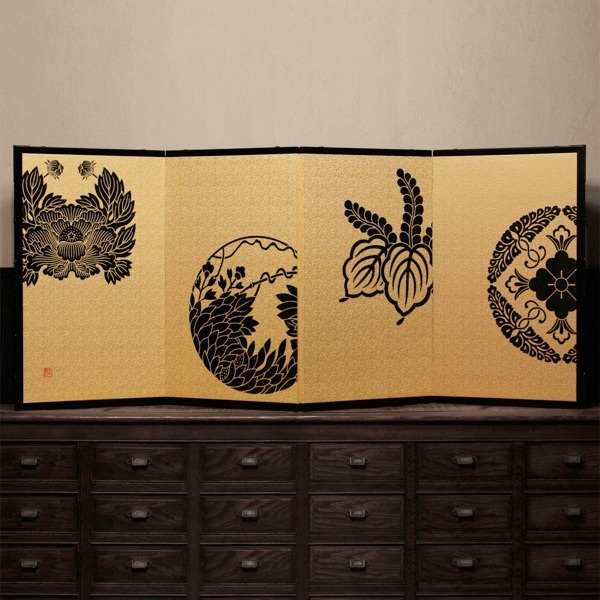 Just like we find the pattern created based on the golden ratio, Japanese family crest patterns impress us with the unique and sophisticated arcs. 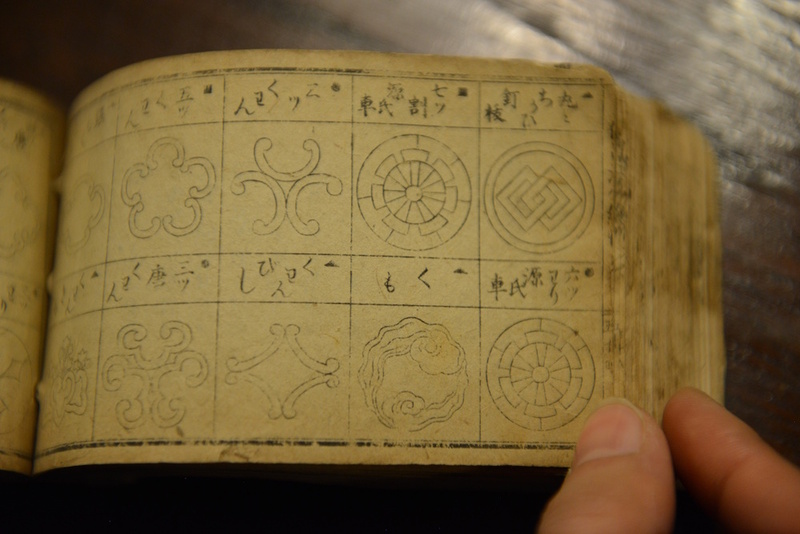 The instructions how to divide a circle in various ways in “Heian Monkan”. 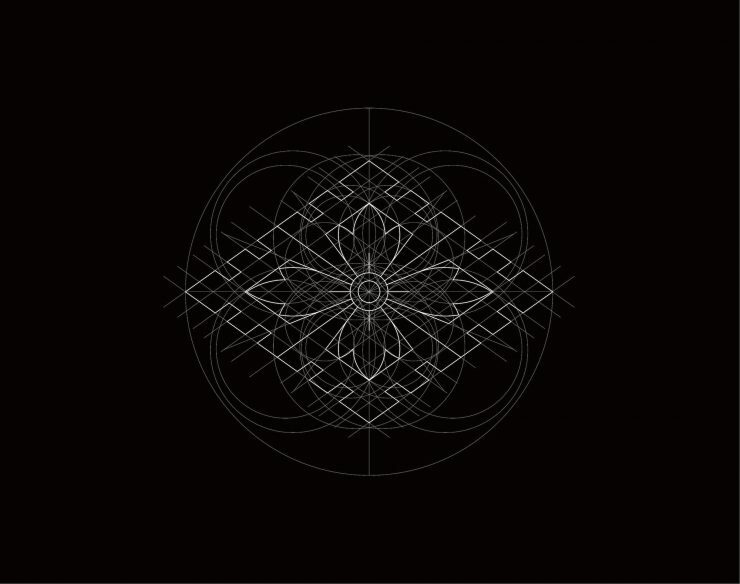 As we have seen the characteristics of the Japanese family crest, the design concept is to eliminate lines and patterns thoroughly and leaves only the ones which have a meaning. 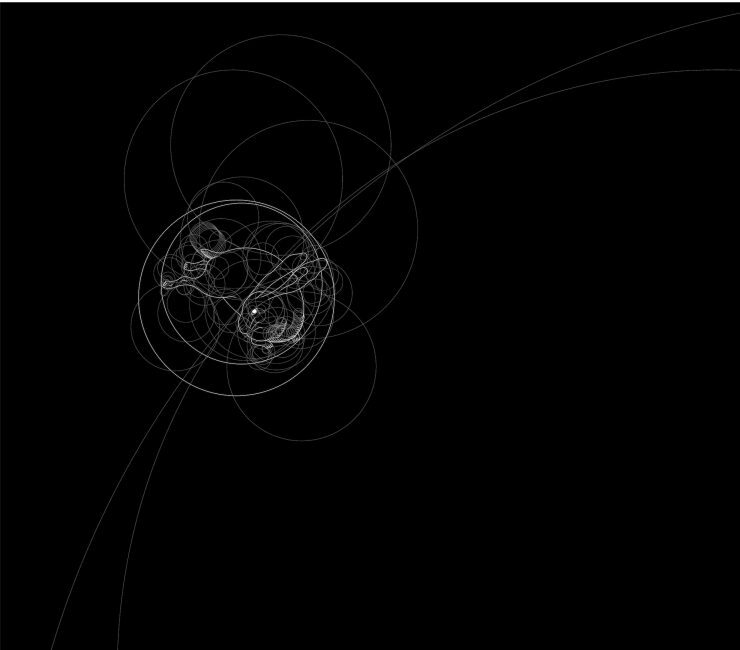 The chosen lines are truly simple but that doesn’t mean they are primitive. They are exquisite and produce highly sophisticated patterns. 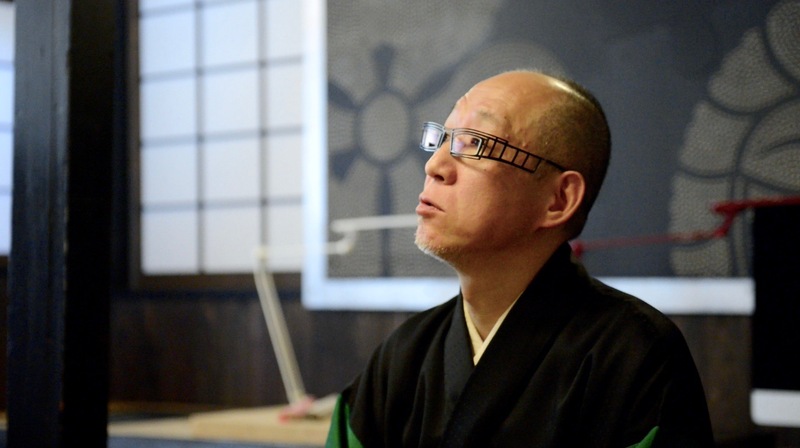 We can explain why the tradition flourished in the Edo period since they are easy to identify. For those who run the business, the logo is very important for customers to recognize even they don’t read words. The technology brought a new inspiration. 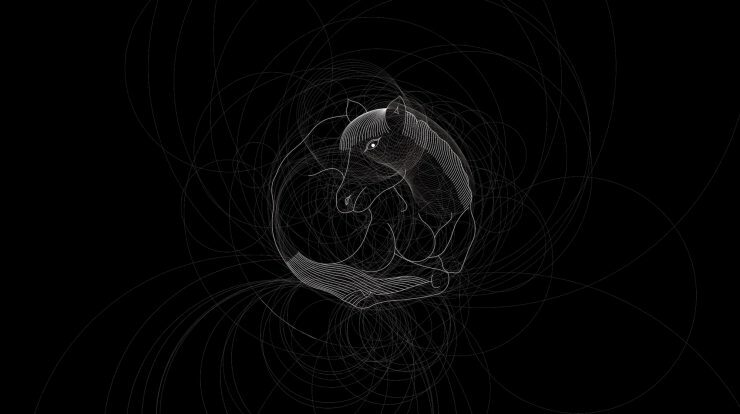 They create new patterns with old and new tools. The traditional bamboo compass and Illustrator in Mac ensure their design to be beautiful, innovative, and cool. Ever since they adopted Illustrator as their design tool, it’s been a great tool to stimulate their minds and create brand-new patterns. Shoryu came up with the new, original method since he couldn’t draw the Bézier Curve himself. He had no problem to adapt himself with Illustrator since he’s used to drawing designs with arcs by freehand. 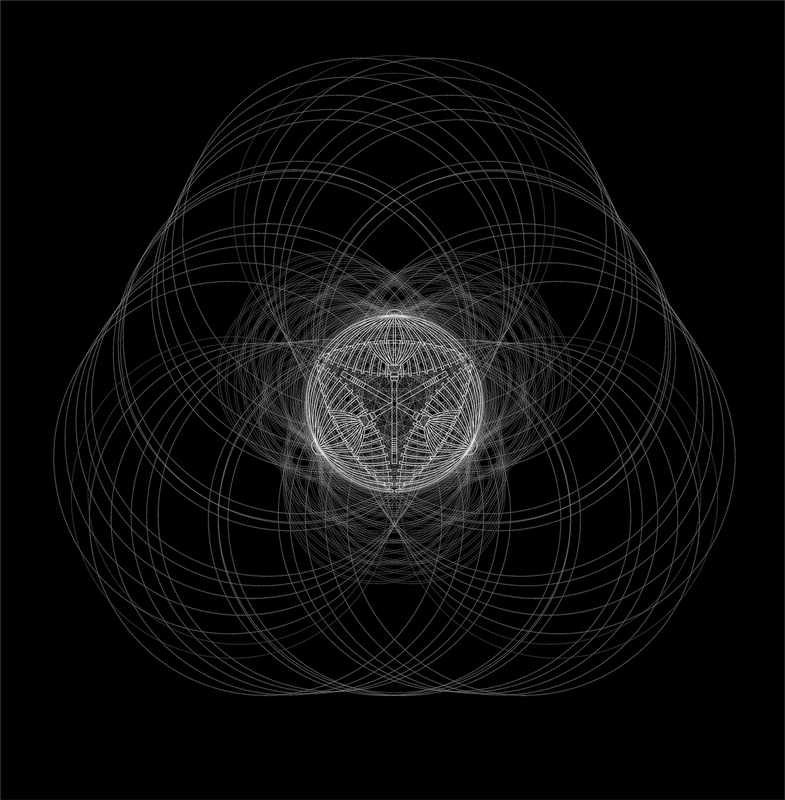 He creates new designs with them and the mandala created by arcs, any lines, and patterns which don’t have existing value is strictly eliminated. Not all the tradition can survive in the course of time but always innovative artists find their way to keep their works alive. 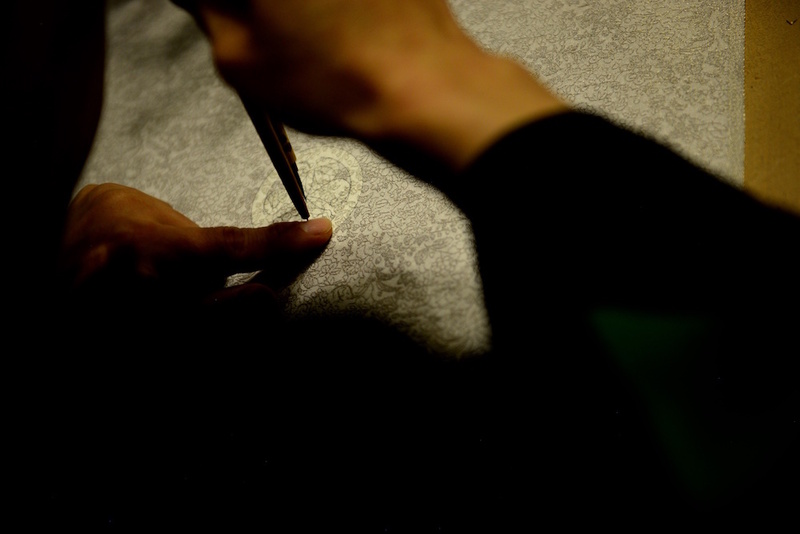 Their canvas is not only on the kimono but anything you can think of putting the crest on. We truly believe the living tradition is innovation. 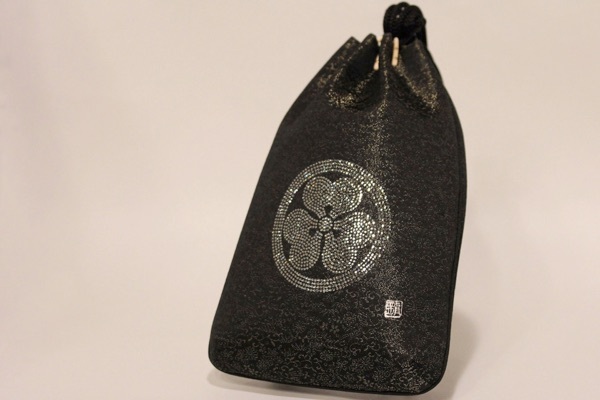 The Kamon is the excellent crest which tells its attribute clearly on any medium so that it can be on a bag, tableware, tiles, doormat, tapestry… anything you can think of. With creating new kamons and putting them on the new medium, this tradition lives on. 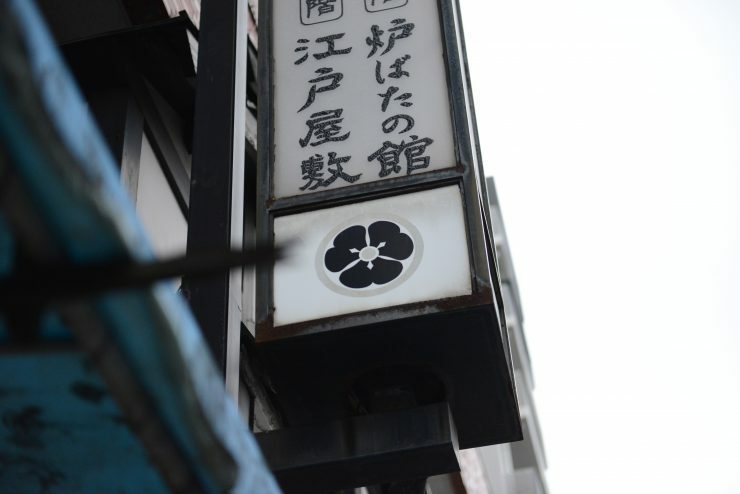 Just like the western coat of arms have multiplied its numbers according to the change of interests, trend, and fashion, Japanese family crests have grown its numbers and found its new medium. So where can we see real kamons today? Except for the chances we go to say special Japanese occasions such as a wedding party or a funeral, we don’t have a chance to see the kamons on kimono. 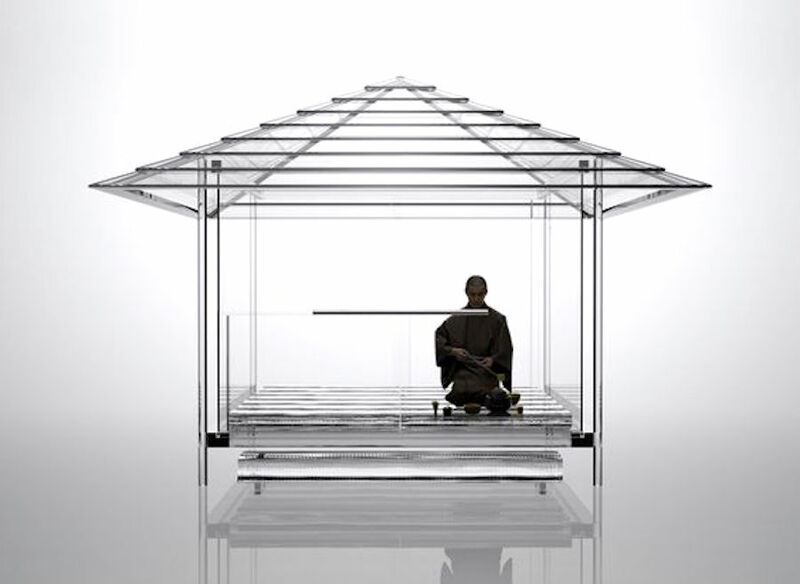 But kimono is not the only medium we can see the kamons as we’ve seen. 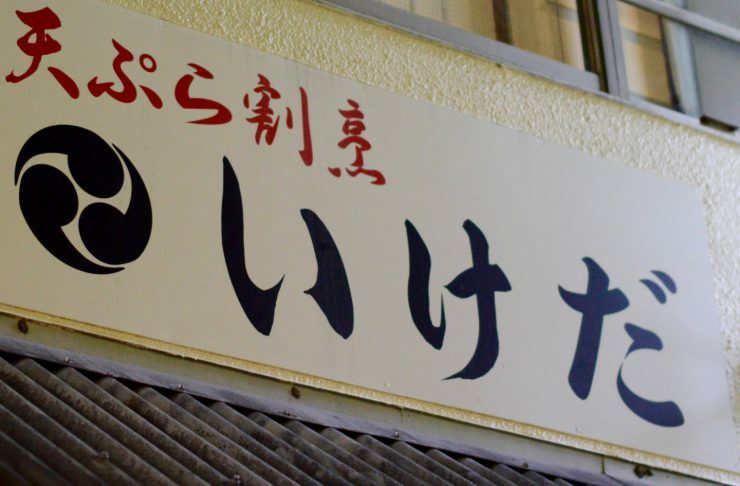 In town, you can find various kamons at the shrines and temples, old shops and stores which at least lasted some decades or even some hundreds of years. Nowadays, the place you can spot the kamons the most is a graveyard. It is like a trade fair of the kamons and you’ll be amazed at their varieties. 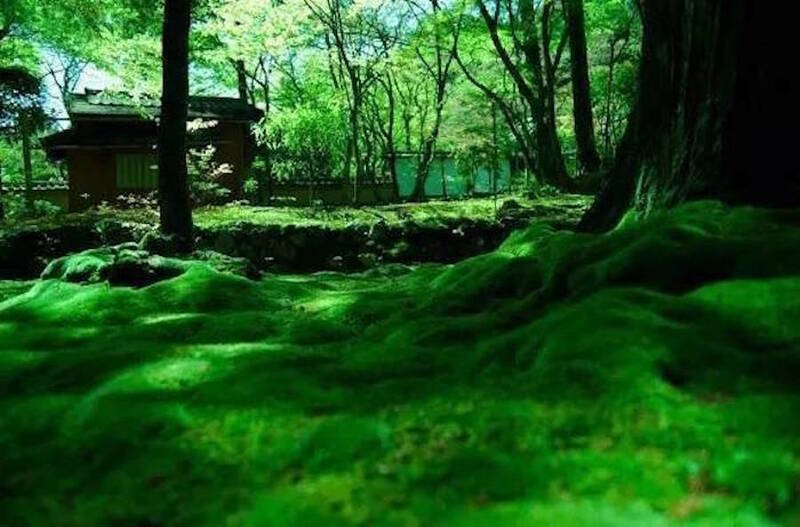 So-called the kamon culture on the kimono is dying down due to the abolition of the family system and the encouragement of western style outfit, however, which opened up the new opportunities and fields to put the kamons on. 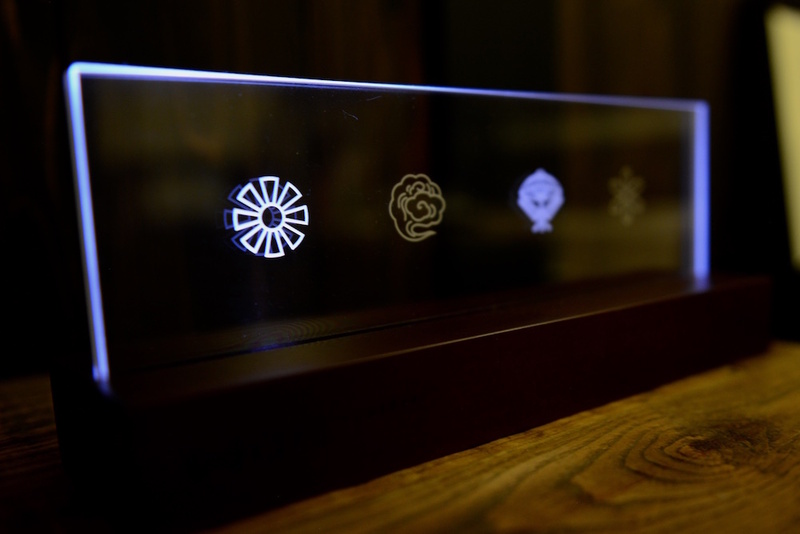 You take a look at each Kamon pattern and you find each meaning, fun facts or history. They can take you the journey back to old times with family lineage. “QM weather. 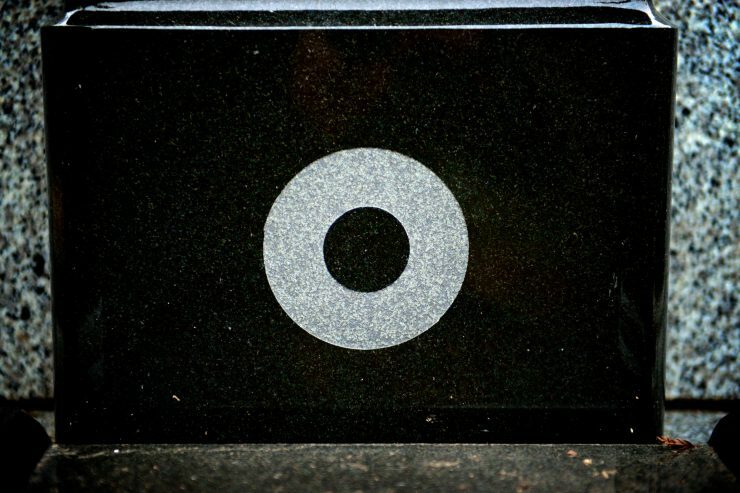 ” The Kamon weather forecasting device, probability? Don’t rely on it too much! Collaboration opened up the new doors. 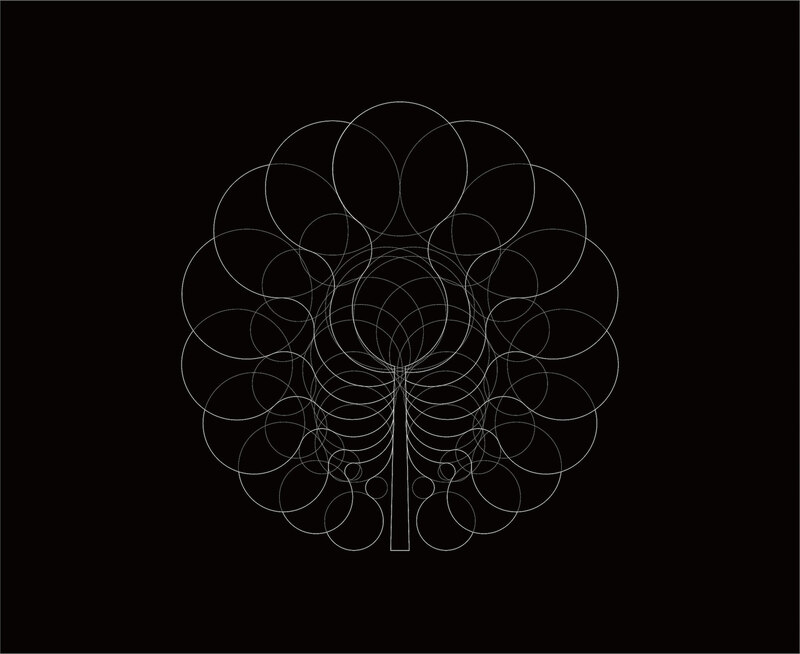 Ever since they were asked to create a logo for the company, their field of work is broadening. Their list of collaborators is expanding in numbers and in varieties. For example, their huge work completed with 13,200 rivets brought them a new collaborator, FURLA, the Italian luxury company which is famous for their bag lines. They are flexible to work with any maker or individual to satisfy their needs and wants in the design. 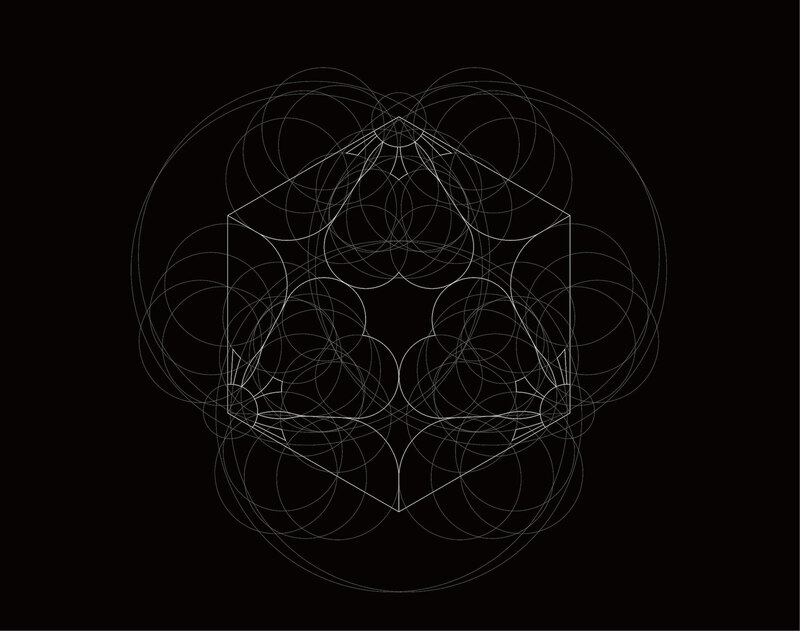 The future of the Kamon lies exactly in that, collaboration. 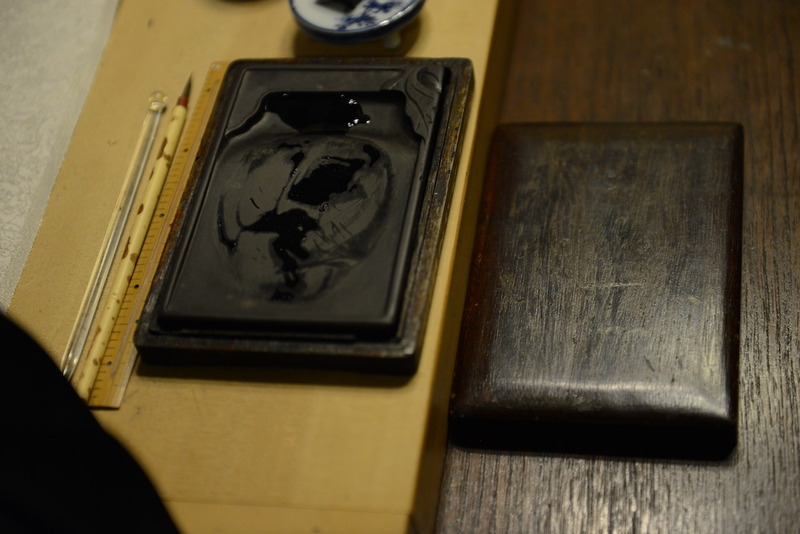 Clearly, the excellent and avant-garde Kamon artisans were someone who was willing to try new ideas to satisfy customers. Perhaps, the tradition lives not to limit or restrict anything but to enrich our lives. Numerous designers have worked with them because they thought design/pattern they create can bring something new or valuable to their product. Not a few individuals asked them to create the new family crest to start their own crest history. 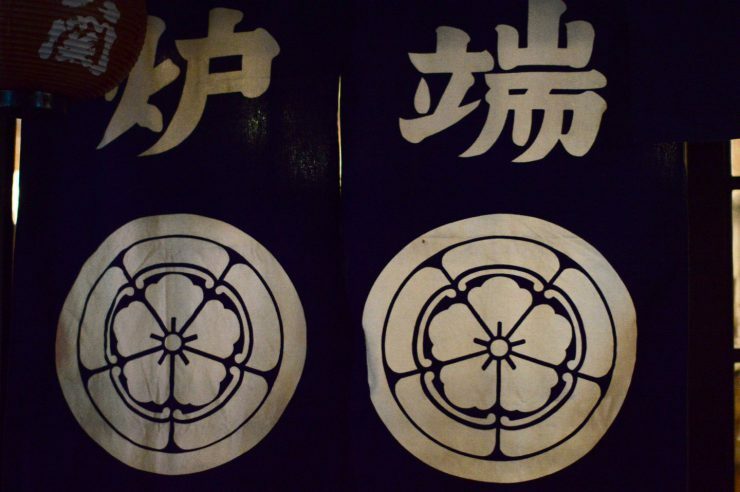 You don’t have Japanese blood so you can’t have the kamon? That’s wrong. 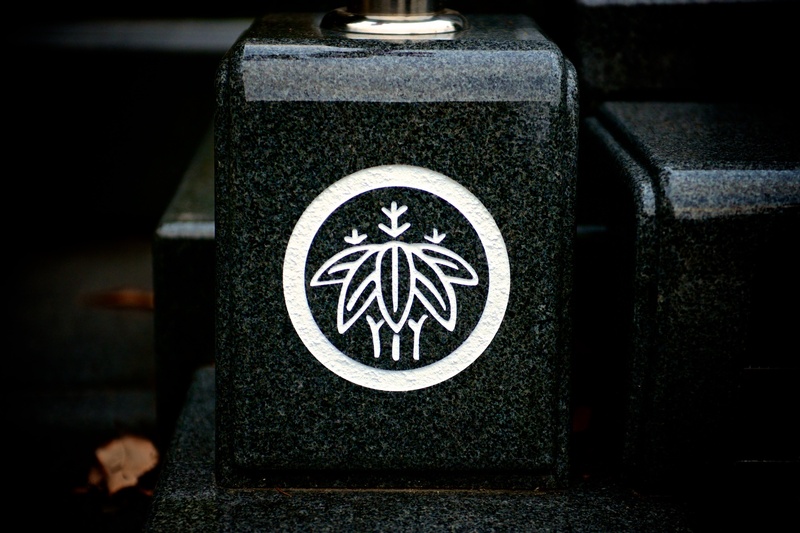 You can start your family crest history with a newly designed kamon staring from you. They are willing to work with you to have your own family crest based on your preferences like you want to use a bird pattern to express liberty or some traditional pattern to create your own one. These sophisticated patterns with historic weight have the endless possibilities to enrich your life. 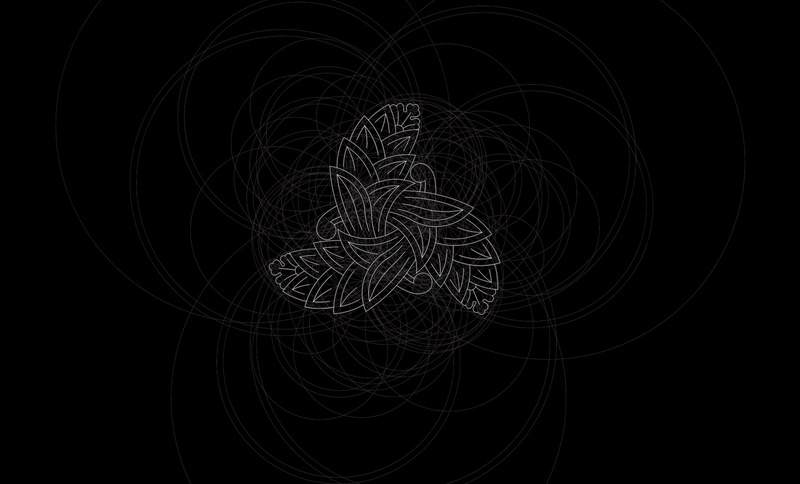 Let’s see what the powerful energy of the kamon can add to our lives! My name is Azhar. I do not have a Japanese lineage but I have just started my own family. Who can I contact to create my family Kamon? I will be going down to Tokyo on 25 Feb and would appreciate if I can find someone who can design a kamon for my family. Thank you and appreciate it so much. Congratulations on starting your own family! We know exactly the right persons you want to contact for your wish. You can definitely create your own kamon for your family based on the families’ history and values. 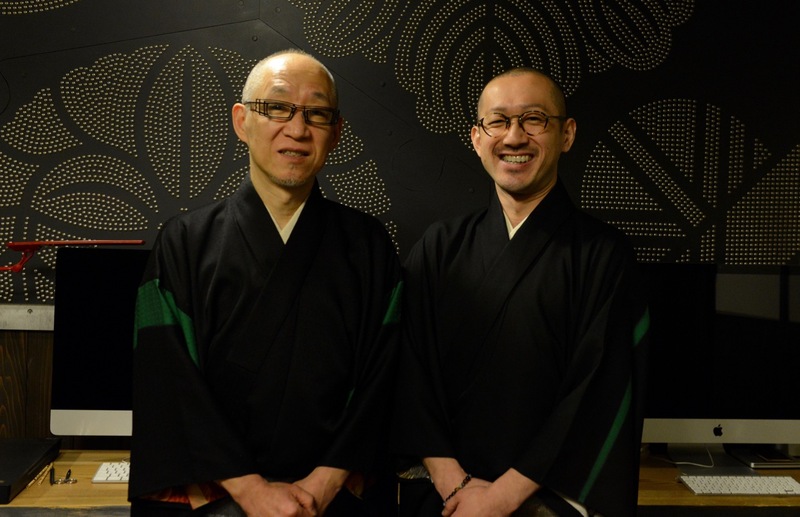 Such innovative work can be done with Japanese family crest artisans, Shoryu Hatoba and Yoji Hatoba (Kyogen Inc.), who work not only on traditional kimono, but also on many products with creative kamons (yes, they make new kamons). You can check out their website and contact them via email: info@kyo-gen.com. Also, you can check out our interview with them from here, which shows their philosophy and innovative works. You may want to write them ahead of your trip to Tokyo that you want to create your new kamon based on the values you want to put into the kamon. Your parents’ family history might help to deepen the concept, the value you want to create with your new one. Please let us know how it goes with your project! I have written to them and awaiting for their reply. Hopefully they will reply before I fly over. Will keep you updated. My name is Michael. I am a graphic designer from Los Angeles. Great website. 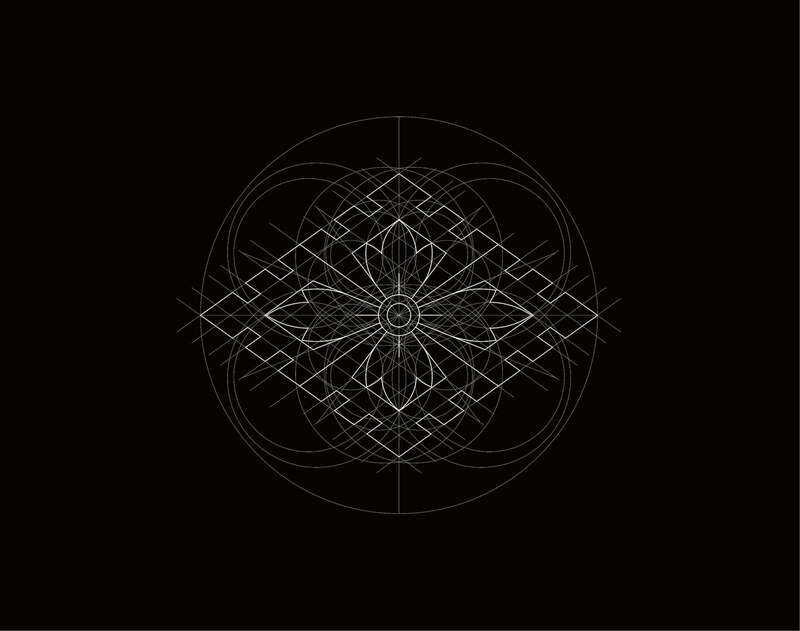 So much interesting information about the Kamon. Can you recommend a book or any available tutorials that shows how one can create a Kamon? Thanks for the comment! That’s a good question if there are any tutorials you can learn to draw kamons. Unfortunately, there is not the exact resource we can refer to as a complete tutorial. Well, the Japanese family crest artisans who we were privileged to interview use Illustrator on Mac to draw Kamons. They say they use arcs to draw patterns. 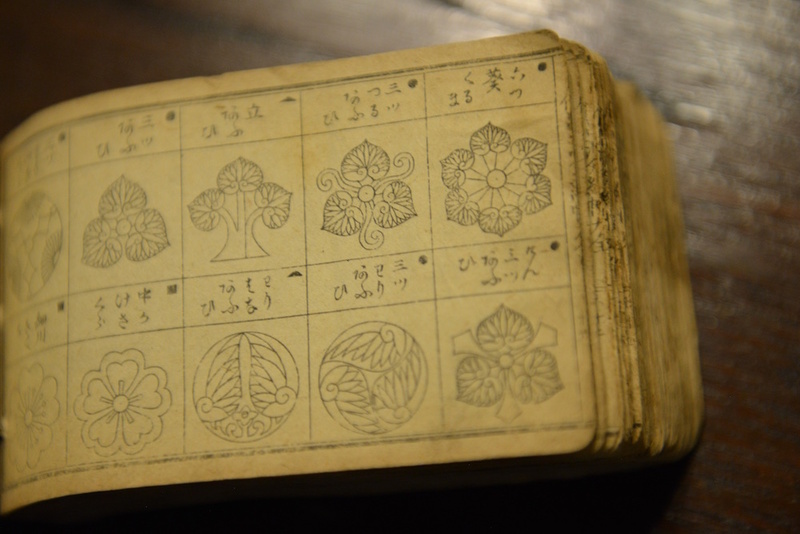 You might want to check out these videos below which may give you a hint of drawing them and it’s a good idea to be familiar with varieties of Japanese family crest patterns so you may get a knack to draw patterns. First of all, arigato gozaimasu! I will certainly look into the videos and books you have recommended. 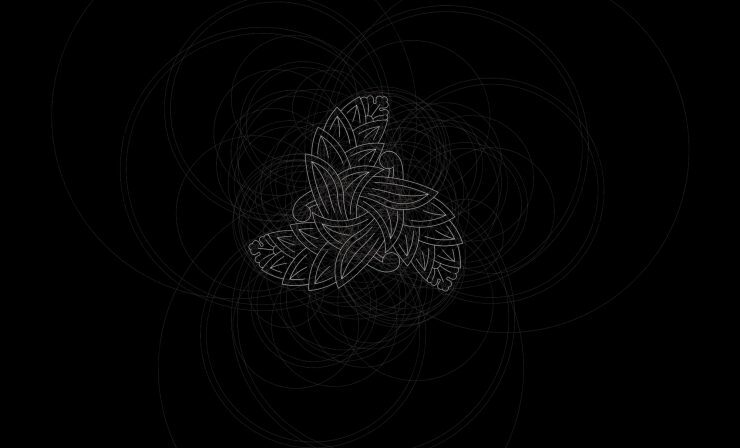 I really love the rich background meanings embedded in and expressed by a kamon. But I’m not Japanese. Is there any artist I can reach to commission a personal crest under the philosophy of kamon? Thanks for the comment! We know just the right people you want to reach out. 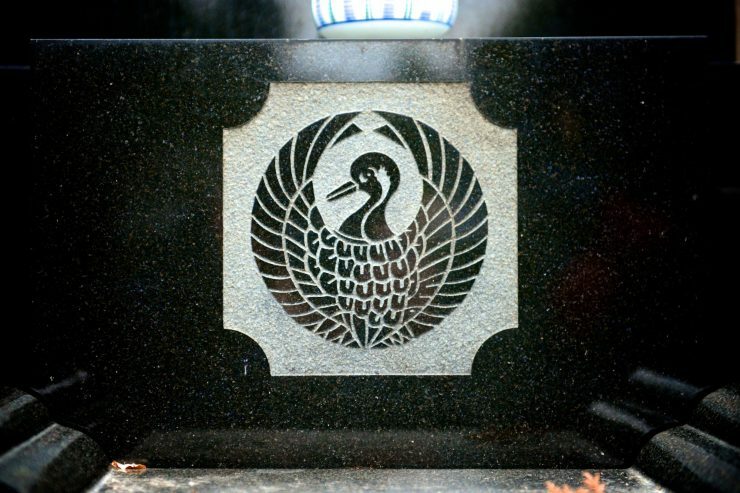 Shoryu Hatoba and Yoji Hatoba are Japanese family crest artists based in Tokyo who we’ve interviewed last December. 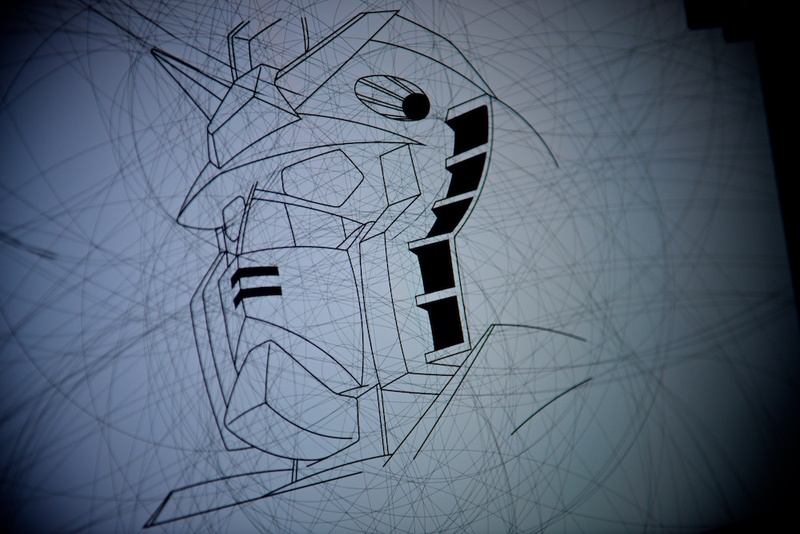 Yoji is the third-generation family crest artist and you can write him in English. They encourage people to have the individual crest as well, so they can be great partners to work with. You can check their website first (http://www.kyo-gen.com/zhu_shi_hui_she_jing_yuan/bo_hu_chang_cheng_long_jia_wen_zuo_cheng.html) and their contact address: info@kyo-gen.com. Hello! I am very excited to delve further into the Kamon. My great grandparents were The Kuwata and my great grandmother’s maiden name was Yoneda. 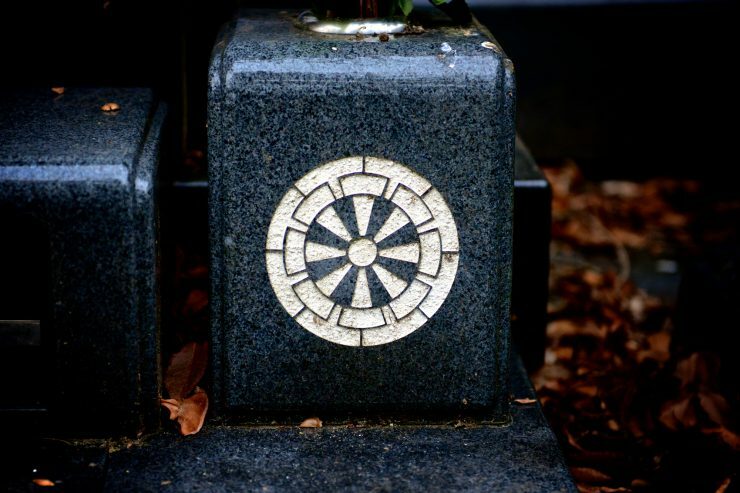 I will definitely be in touch about researching the Kamon for either family. Thanks for the comment! So you’d like to delve into the kamon both from your paternal and maternal line (Kuwata and Yoneda families). Having information on each family domicile and any other information related to the family would help. Thanks for contacting us! So you already know your kamon, the ivy crest. We can help you with our standard service to compile the report of possible origin and history of your family name and the kamon (family crest). You can check our service from here.